A basic rule is that trapezing Catapult is easier than struggling upwind easing the main and hiking. Trapezing adds about one third to one half again to the power (not doubling it, as with a dinghy) The margin gives a clear boost of power which can still be handled easily once out on the wire. Beginning trapezing, the trickier parts are getting out and back but practice makes these routine. Initially, it is easy to put off practicing, or to put off trapezing in a race---the conditions are already a bit daunting with a lot going on, and it is tempting to push on, flattening the sail and pushing up to windward. This can be effective (and see final comments further below) but usually the trapezing boats will have a steady advantage and will surge forward during puffs. Getting out on the wire. The trapeze is hooked on and the the helmsman's weight dropped back over the edge of the beam by 2-3 inches, before the wire takes up the helm's weight. Hanging on the handle, the front foot pushes off from the top of the centreboard, using it as a ladder to then get both feet on the beam, about 2 feet apart. Coming in, the handle is grasped to lift the weight over the beam, and the harness unclipped as soon as on the beam. Different helms have slightly different techniques, so the aim is to have a settled confident personal routine. 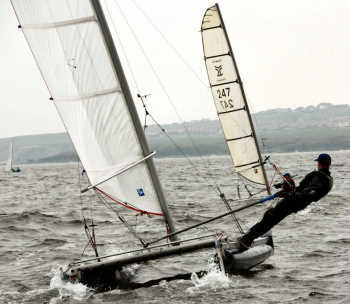 Paul Ellis (above) demonstrates the advantages of trapezing: not only the added power, but also a stable platform, with a good view ahead, and an easy check on the sail indicators. Above; A light-weight helm, Gareth Ede, hunts down a less light helm, his father Stuart. If the strength of wind stays at this level, and the beat is long enough, Stuart is doomed, as Gareth has more power with a lighter weight. Tacking from the trapeze: coming in as the tack begins . This technique gives a big advantage, as the boat speed swings the bow through the tack quickly (in conditions where seas are likely to be already lumpy and difficult.) As well, the weight on the wire as the handle is pulled to come in lifts the bow, and drags the bows around. It is much easier than it sounds! Paul jams the mainsheet, swings in while starting to push the tiller over, and once kneeling on the tramp chops out the trapeze hook, uncleats the main and completes the tack. Not cleating the main means one less thing to do, and less risk (see below) but if the main is slackened too soon, the leech slackens and will not push the boat quickly up into the wind. The basic technique is to begin and commit to the tack while on the wire, and get in and off the wire quickly as it comes head to wind. The kneeling position in the middle of the boat allows safe quick movement. Alex Montgomery comments that moving off the wire, sheeting in and crossing the deck means a lot of change for the boat, so that it is important to be smooth, and confident and quick. Other helms prefer to come in off the wire and get the boat going again before selecting the time to tack. All may elect this if the sea is confused or particularly large. 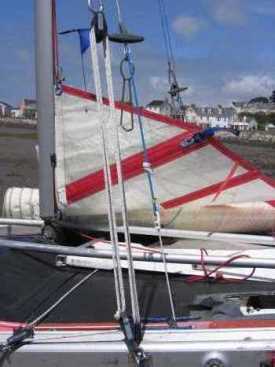 A rushed tack often ends up in the rudders stalling - having to steer backwards, rudders reversed, to complete the tack. The risks of beginning the tack from the wire appear greater than they actually are---as at any time, if you can get to the middle of the deck, sheet released, the boat is stable while the crisis sorts itself out. If this does happen, the boat seems to sit on the same heading (as the helmsman, initially hanging from the wire beside the boat, becomes a sea anchor to windward) rather than come head to wind. Above: Alex Montgomery creaming along on the wire at Bewl, legs bent to bring weight a little inboard. Gear for trapezing Some stick-on grip along the outer edge of the hull beam (only along the 45 degree angle bit of the beam, not the top or side) gives confidence you won't slip. Alex uses an aluminium adjustable tiller extension, with a mark to show where to adjust it to (not too long or short.) as this helps to give a consistent feel. He shortens the tiller extension for running downwind and extends it just before rounding the leeward mark. Most boats are fitted with a an adjustable trapeze set-up (raising or lowering the ring by about 30 cm) but almost all helms leave the wire where it is while racing. Alex comments that rigging or de-rigging, he attaches/detaches the trapeze wires separately, to minimise tangles. He puts the trapeze wires on only if it's windy, as sailing without the harness also feels good. This article may read as an advertisement for trapezing Catapult (which it is!) but individual helms will still find what suits them best, and build on that. Alex Montgomery argues that in strong winds there is a fine line between sailing the boat lightly off the trapeze (avoiding driving the leeward hull deep into the water and increasing drag) and putting on more power from the wire. and that he has been able to sail fast without the trapeze in strong winds. He says that being inboard and hiking gives you more control as it's easier to move your weight around in a bigger sea, responding to gusts and concentrating on sailing the boat. Sitting on the wire can mean some loss of feel for how well the boat's moving through the water. So, it's not clear cut, but trapezing, compared to hiking, is definitely easier on the stomach muscles and a good option to have at your disposal, if only to make the beats physically easier! 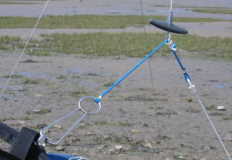 Below: an example of a trapeze set-up, on Alastair's boat. 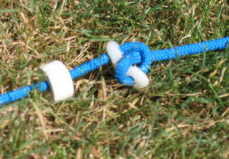 The return shockcord is led to the end of the cord supporting the ring, so that when hooked-on sitting on the deck, the cord is always kept under some tension, so the ring is pulled up into the hook, avoiding coming free. Going out on the trapeze (above left) the cord comes up against a stopper, which sets the height.